I can’t even begin to count how many Mondays of my life began with this thought. I decided I wanted to lose weight (…again. How much? The answer has varied, but upon reflection, it actually didn’t matter; I wanted to lose however much was enough to be, “good enough.”). In an effort to accomplish this goal, I printed off pages of workouts, bundled them up into a notebook to take to the gym, and set to work figuring out what foods I was “allowed” (and also not allowed) to eat for the next 30, 60, 90 days (or forever, as though I could will myself to hate pizza). It was easy to buckle down and adhere to this plan, as I knew that at the end of the week I’d get to my, “cheat meal,” feel relieved, and hop back on the wagon the very next day. As I’m sure you can imagine (or have experienced), it never quite worked out that way. After 5 days of, “perfect” eating and moving, I got to Friday night. I’d take myself to the grocery store after work, loading up my cart with all my little treats, salivating in the aisles anticipating this, “indulgence,” feeling a little rush of rebellion, because I got to be, “bad” (something in which I rarely dabbled, as I was always looking for how I could be, “good enough..” You, too?). I’d get home and unpack all of it, grabbing some chips as I preheated the oven to make enchiladas and put the Kit Kats in the freezer so they’d be super crunchy in a few hours. The project of selecting the perfect movie to watch was completed over popcorn, and gooey cheese was my favorite complement to every film. Saturday rolled around, and, although my stomach hurt from the night before, “I might as well finish the Kit Kats, because it’s Saturday,” and then, “well, I need to get this food out of my house before Monday morning rolls around,” so Sunday night was often spent in pain. If I WAS far off my Friday weight, I was a failure, and the only solution was to buckle down even harder the next week, promising myself that this week, a “cheat meal,” would be just one meal. I firmly believe that this line of thinking is next to impossible to avoid in our culture. We frame food (and health in general) as a moral issue, assuming that everyone wants to be our definition of healthy, that some foods are superior to others. We believe fat is the worst thing one can be (and make it so, with the endless comments, jokes, and caricatures we make about weight). We ascribe to the notion that our worth is tied to our weight and our health. Understandable, certainly, but doing a tremendous amount of damage to every last one of us. To be clear: not one single number has anything to do with your worth. Moreover, you owe no one your health, any particular way of eating, or an ideal body. You can eat and move and be whatever, whenever you want, and you are still a magificent, magical being. 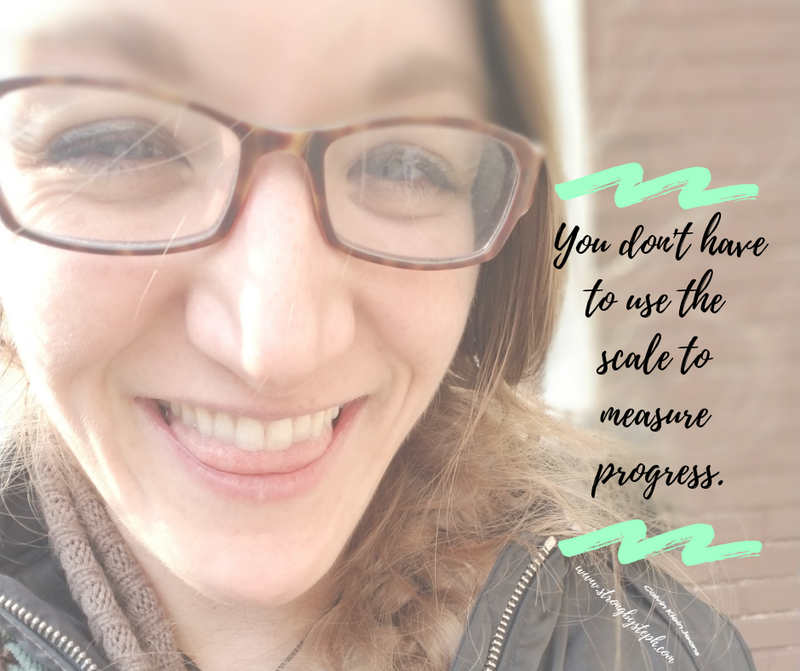 YOU DON'T HAVE TO USE THE SCALE (or the plates on your barbell) TO MEASURE PROGRESS. If, like me, numbers send your brain into A Beautiful Mind-esque frenzy, quickly drowning out any hacks, habits, or happy affirmations, please accept this permission slip to rid yourself of this particular report card. 💫 Did your knees stop caving in on your squat? PROGRESS. 💫 Did you find a variation of an exercise that caused you pain, so now you can train that movement pattern or body part safely? PROGRESS. 💫 Did the weight fly up, move more smoothly, or feel at home in your hands? PROGRESS. 💫 Was your mind free of, "are they looking at me?" thoughts? PROGRESS. 💫 Did you not need your usual pre-gym pep talk to walk through the door? PROGRESS. 💫 Have you chosen foods you actually want to eat, rather than what you feel you should? PROGRESS. 💫 Has the rushing river of, "I hate my bat wings/spare tire/love handle," dried to a babbling brook, or even slow trickle? PROGRESS. It's EASY to get caught up in numbers. We've been graded since birth. If you’re here, you likely know that there is so much more to fitness than numbers or sizes or PRs. You probably feel like the fact that you still care about it is yet another failure, right? Au contraire, my friend. It's just part of the package. We’re swimming upstream in the waters of diet culture. It’d be impossible not to care, at some point, at least a little bit. It comes with the territory. AND, you get to rearrange. You get to decide what matters. You get to choose what success looks like for you.